With 16 seconds left in the 1993 national championship game between UNC and Michigan, his team down two, Chris Webber grabbed the rebound of a missed UNC foul shot. With no timeouts left, the Wolverines needed to take it the length of the court to score. If there was anyone to trust with the task, it was Chris Webber. Webber, the best player in the country at the time, was a baller. Straight baller. And like the best do, he brought the rock up hoping to solidify a national championship or, at the very least, force overtime. But as he pushed it up the court, UNC lured him into a half-court trap and before he knew it, Webber had picked up his dribble in the corner of the court. 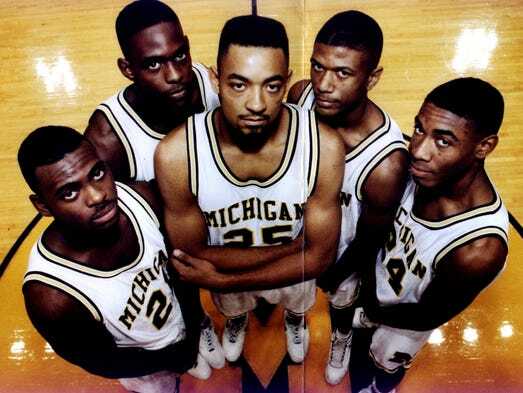 In a moment of confusion, Chris Webber, the best college basketball player in the nation, the heartbeat and savior of Michigan basketball, called a timeout. But with no timeouts left to give, a technical foul was called. UNC sunk both foul shots and got the ball back. The rest is history. Michigan lost the national championship because of Chris Webber’s fluke. After his horrible mistake, it was like Webber had seen a ghost, his face gaunt, his towering 6’ 9” frame somehow seeming small. He knew what he had done, and though the coach gave some instruction during the timeout after the miscue, the whole arena knew what the outcome would be. Chris Webber, in the world of basketball, was hopeless. I’m not really sure how to transition from Chris Webber, the leader of the “Fab 5”, and key NBA2K5 franchise player to W.H. Auden’s Christmas poem “For the Time Being”, but I’m making the jump. As my wife and I began reading through the poem this Advent season, we were surprised how it starts. While my natural tendency is to fall into a giddy state once December 1st hits – the tree goes up, Christmas tunes are buzzing, and gift lists get compiled – Auden begins the season of Christmas at the edge of an abyss. Of hostile objects could be as terrible as this Void. This is the Abomination. This is the wrath of God. It is foreign for us, at least for me, to begin Advent, the season of waiting, like this. I want white powdered snow throughout December and contagious Christmas cheer, not the mess that comes when the flakes turn to grey mush. My tendency is to sing “Joy to the World”, not consider the dirge of “O Come, O Come, Emmanuel”. Auden begins Advent with hopelessness and unfortunately for Chris Webber, that’s where the 1993 national championship game ends. The weight of epic failure and defeat on full display, the mistake that cripples him. Nothing can save us that is possible. The good news of the gospel is so good because it is something that is done to us and for us, it begins with Jesus who, out of his great love, comes to us for the purpose of saving us from the hopeless abyss; we cannot do it on our own or even aid in the process. To think anything but means that we’ve been tricked by some other agenda parading as a remedy; masquerading as self-prescribed news to people who really don’t think they are hopeless or think they can defeat what can never be outrun. Even (especially) as those who take joy in Jesus’ birth and wait in expectation for his return, Auden (and Chris Webber) show us our humanity. This Advent, like every Advent before, reminds us that in our helpless estate, nothing can save us that is possible. Praise God for the impossible miracle of Jesus.